First, as Paul’s figure suggests, here’s a scatterplot that looks pretty random. One can, of course, plunk a regression line in there, and it has the “wrong” slope (higher rates associated with faster growth). To be clear, I neither think nor claim that higher top rates lead to faster growth (though such a case is sometimes made). These are just correlations. More on that in a moment. In fact, 2o-year rolling correlations have a little something for everyone, which again, shows the absence of any systematic relationship supporting the high-top-rates-kill-growth story. These are very simplistic ways to look at this, not at all dispositive. However, deeper looks yield similar results. Moreover, I wouldn’t dismiss the simple correlations. My experience in this sort of work is that if the correlations aren’t there at this level over long time periods, you often–not always, of course–have torture the data to find them. In they are there, then you must check to see if the correlation is a function of a statistical problem (e.g., serial correlation) or a missing control variable. But if they’re not, it’s often telling you the argument that they are is going to be a heavy lift, very possibly involving more confirmation bias than honest analysis. 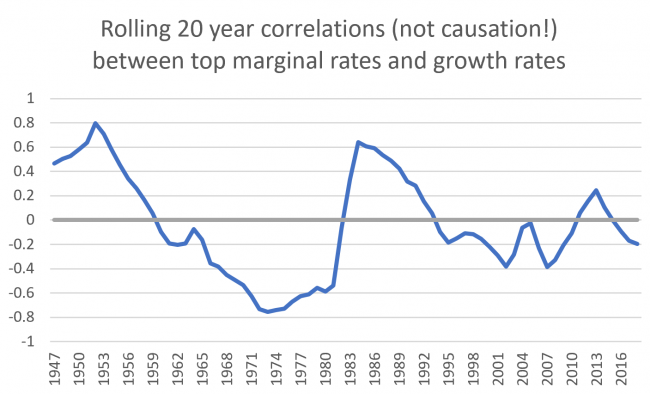 Share the post "No correlation between top tax rates and growth rates"
8 comments in reply to "No correlation between top tax rates and growth rates"
Also in the WaPo piece today, optimism about the progressive tax policies of AOC, Warren, et al. It’s a pleasure seeing these policies getting some attention, sure, but is that any real reason for optimism? Not until the Democrats win their own trifecta, which can’t come before 2020 (and even then the Senate is still hugely iffy). I can’t at the moment imagine a single piece of progressive tax legislation being approved by a GOP-controlled Senate. I hope I’m wrong. This plot looks like a great example related to the concepts of the Armey curve and the Laffer curve. Growth is low at a low tax rate, highest at an 80% marginal tax rate, and falls at a 90% marginal rate. Obviously an 80% marginal rate is optimal. optimal top bracket would be 73%. 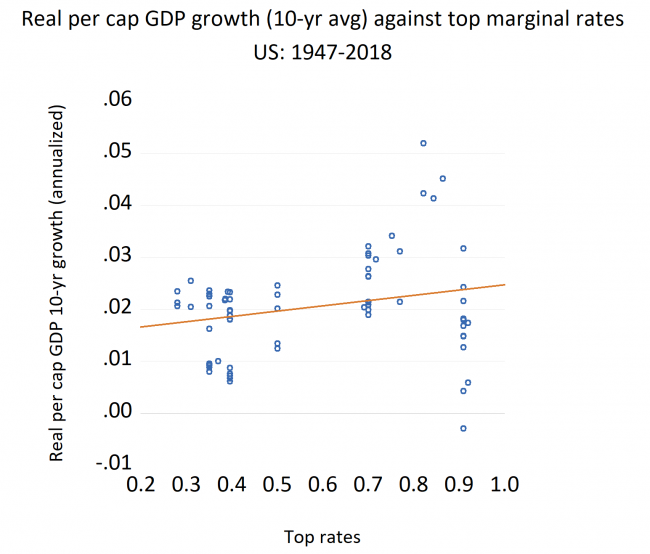 An interesting challenge – is there any correlation between top marginal rates and percentage of GDP raised by income taxes? Would be interesting to know whether the historical experience is that higher rates did in fact raise more cash…. If I were to imagine a trend to the scatter plot, I might fit a polynomial or exponentially increasing trend starting at 0.01 at 10% with a collapse from a peak of 0.05 down to 0.01 at 90%. The results at 90% marginal taxes may be explained by a general “malaise” in the economy when the hands of policy makers are forced. It is heartening to see that increased marginal rates do not impact growth significantly and even help the economy up to a certain point. Of course, my interpretation is as useful as a caveman looking at stars in the night sky and seeing patterns etched by the constellations. So let’s shift over to what I believe instead. I believe that consumption improves when wealth is spread around and people are able to live lives of leisure and dignity regardless of occupation. That does not mean that higher ability should not be rewarded richly. The hyper-capitalism in the western world seems to reward risk-taking and does not celebrate passion, idealism and loyalty to purpose — these are psychologically more valuable to desired outcomes when we consider the quality of GDP.